You've just got time to nominate your social care heroes for the Wales Care Awards 2015 if you hurry – nominations close tomorrow (March 31). It's easy to do – just follow the links below for information and, if in doubt, call Janet at CFW and she can help you with your nomination. The awards really are the 'Oscars' of the social care sector in Wales (and a great night out for you and your colleagues) so we'd love to hear your nominations. If you know someone who goes the extra mile in social care, from catering staff to nurses, managers to new recruits, now is the time to nominate them for a Wales Care Award 2015. The nominations window for the awards closes on March 31 giving you just two weeks left to nominate. You can now do this easily by filling out a nominations form online. First held in 2003, the Wales Care Awards are an annual fixture in the social care calendar. They reward the champions of the sector and raise public awareness of the vital contribution made by the social care workforce to the health and wellbeing of the people of Wales. The Wales Care Awards have helped to raise the status and profile of the work of the social care workforce in Wales. See images of the 2014 winners and like our Wales Care Awards Facebook page! Each year there are 21 awards categories ranging from excellence in leadership and management to nurse of the year, excellence in catering to dementia care. The generous support of our sponsors makes it possible to invite guests from more than 100 representative organisations from the public, voluntary and private sectors. 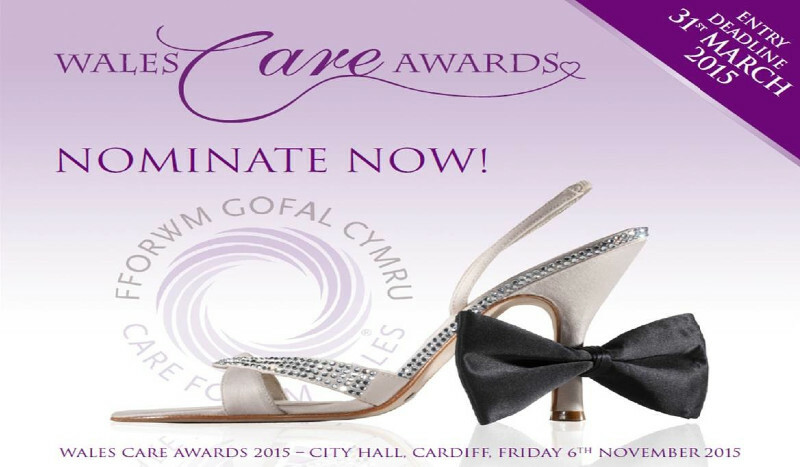 In 2015 Wales Care Awards will take place on Friday 6th November at City Hall, Cardiff.